The latest report from the Economic Analysis Division on sales-and-use tax revenue pointed to a substantial increase in revenue. Based on historic experience with some EAD publications I was immediately skeptical to their numbers. The biggest problem, however, is how those numbers are represented in media, and - frankly - how the EAD writes its news briefs on their reports. Notably, even their chief economist hints of a problem here, an issue I will return to in a later article. It is important, namely, to examine the EAD's publications and research. Their work carries considerable weight with the legislature and the governor. One of their most prominent products is the "we only pay for ten percent of our government" chart, a product that is riddled with errors and implicit assumptions to a point where it is best used as a Swiss cheese. I am working on a re-examination of that chart, which should be up early next week. Perhaps the most enduring problem, though, is with the series of CREG reports. Specifically, these reports make forecasts about tax revenue that are heavily influential on the legislature as it makes its budgets. Over the past few years, with a major drop in tax revenue, the CREG reports have, frankly, been useless to the point of misleading our legislators. At no point has CREG predicted made meaningfully accurate predictions that could have helped the legislature avoid big budget deficits. Put bluntly: if CREG has done a better job, it would have been easier to convince our legislators, and our governor, that we need to reduce spending. 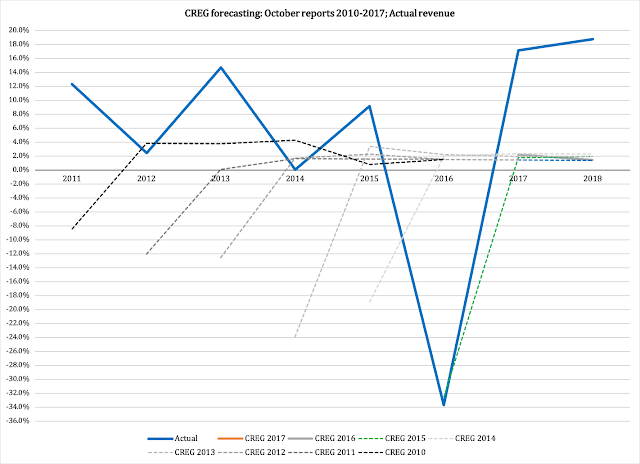 The first year of each forecast displays a drop in revenue. The reason for this is not that CREG actually predicts a decline every year, but that the first-year figure in each year's forecast is compared not to what CREG believed revenue to be "this year" at the time it published each report - but the real figures for that year from the October 2018 report. 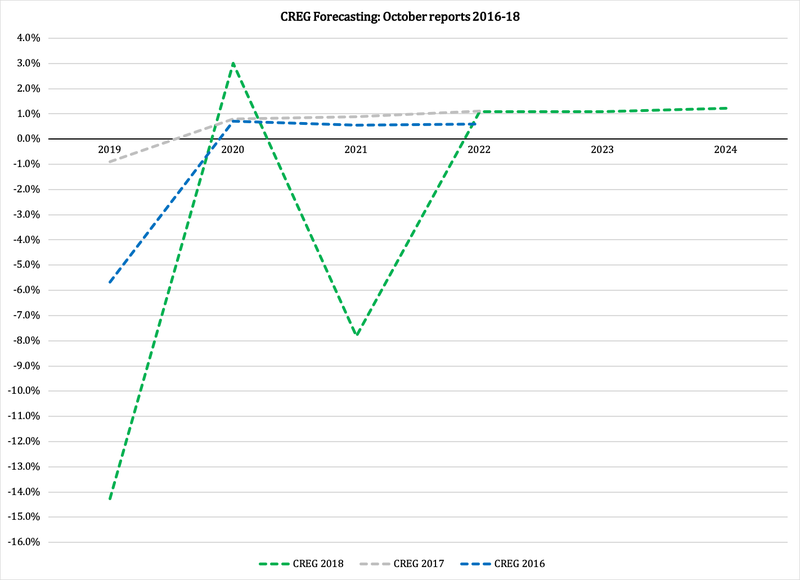 This may seem a bit unfair to CREG, but it puts on display a recurring problem in their own forecasting: since the first year for their forecast compares "this year" to "next year", one would expect their prediction to be rather close to reality. Instead, what seems to happen each year is that CREG misses the mark in the same direction. 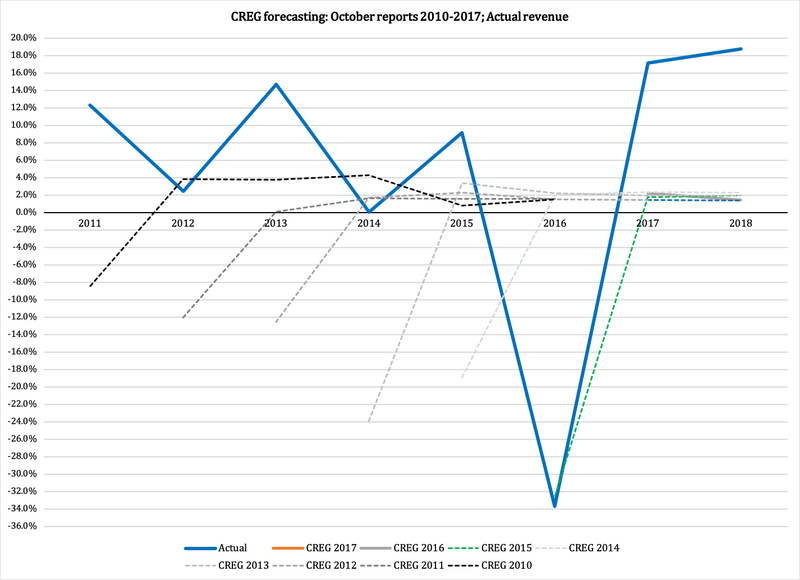 There is an apparent purpose behind this prediction error: by lowering the revenue estimate for "this year", CREG can conveniently predict a rise in revenue "next year." This is not honest forecasting, but a bias that looks political: if legislators are led to believe that revenue will continuously rise, they will be happy and continue to spend as if revenue will continue to rise. Then there is the alignment of the forecasts over time. For some reason that only CREG can explain, all their forecasts from 2010 through 2015 conspicuously converged around a long-term growth trend of two percent in total General Fund revenue. Since then, there has been some adjustment - a tweak to their model - to where there is hardly any trend in revenue. This is not substantially better, but it is at least a tad more honest. The dashed green function is the latest forecast. It predicts a drop in General Fund revenue from $1.39 billion in 2018 to just over $1.19 billion next year. After that, oddly, it predicts a rise to $1.23 billion only to be followed by a drop to $1.15 billion in 2021. Having worked with economic forecasting, I know that it is a veritable minefield of errors waiting to explode on you. I commend CREG for stepping out of its comfort zone, but I am curious as to how they reasoned their way to this pattern. The only logical explanation I can see is that by predicting diminishing swings in revenue - which is what the curve for 2018 does - they allow their econometric modeling to take over. Standard models do not produce "rigorous" or "robust" results unless they can predict long-term stability. To understand why, we have to go back to macroeconomic theory as developed in the mid-20th century. I fundamentally disagree with that theory, based on its ineptitude in explaining and predicting economic reality. Nevertheless, those who hold econometrics in high esteem have to rely on it to make a living; I, for one, abandoned econometrics long ago; it is a costly, time-consuming methodology that adds almost nothing in terms of value to our understanding of reality. On the contrary, econometricians are so often wrong in their forecasts, that if they got paid based on accuracy they would owe the rest of the world a lot of money. All in all, I am glad - again - to see that CREG has become slightly more inclined to align themselves with reality. What is missing from their publications is a willingness to accept the fact that reality is nowhere near the stable, smooth path that forecasters need to get the results their clients often want. Yet this is precisely what CREG needs to do: so long as our legislators rely on their forecasts, and so long as the forecasts always provide the image of smooth revenue growth in the future, our legislators will continue to be irresponsibly short-sighted in budgeting state spending. As mentioned, I have two more articles on EAD publications coming. However, they will have to wait until after the weekend.